There was word a while ago that the Nokia 8 would have Treble implemented on the final build of its Oreo update but that is not to be, as company CPO Juho Sarvikas has confirmed the lack of Treble on any Nokia device, much like we saw from OnePlus a while ago. Nokia under HMD has shown glimpses of what made the original Nokia brand so universally loved, with the company going out of its way to meet end-user needs. It came as a surprise, then, that when the Nokia 8 received its Android Oreo update last week, Treble was nowhere to be found. 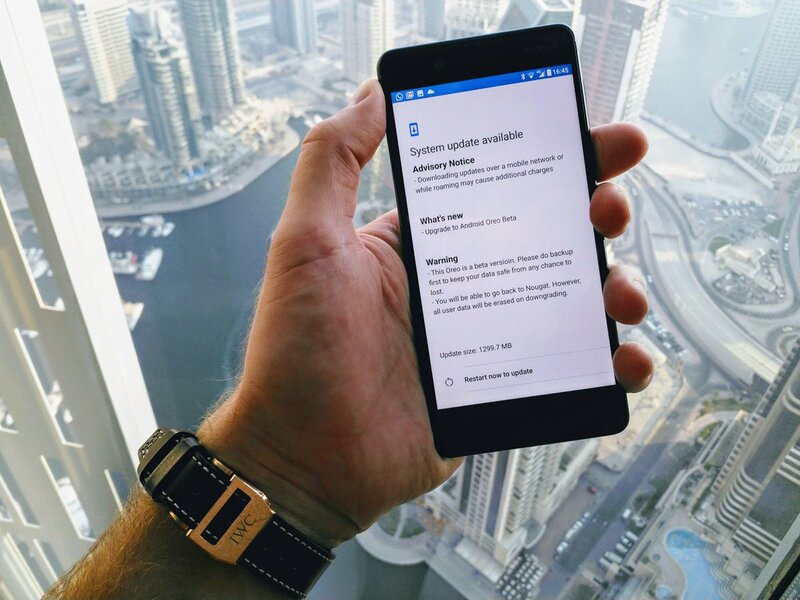 Treble, for those not in the know, is a new feature by Google that cuts out the need for vendor and carrier action in the process of sending out updates. The feature is mandatory for devices running Oreo out of the box, but not for those updated from Nougat. A few OEMs, however, Huawei and Essential, for example, have implemented the feature on their Oreo updates. That considered, it was expected that an OEM as consumer friendly as HMD would also implement the feature, especially since the company has provided timely software updates and shown genuine positive reactions to user complains and wants. 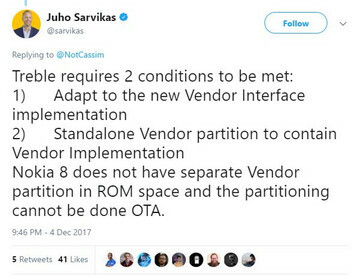 Nokia customer service had previously said that the update to Oreo would have Treble implemented but HMD's CPO, Juho Sarvikas, has confirmed that it will not. He also went on to clarify the reasons for the decision, citing the lack of a special vendor partition—one lacking on the Nokia 8, and which cannot be created on an OTA update—on the device. This raises the question, though: How did the Essential PH-1 and the Mate 9 get Treble? OEMs are usually way ahead of consumers in terms of technological developments in the system, so there's a chance Huawei planned way ahead for Treble, especially since their devices use the in-house Kirin SoCs. Essential also has close ties to Google, so it's also possible that, much like the first-gen Pixels, the PH-1 was designed with Treble in mind. 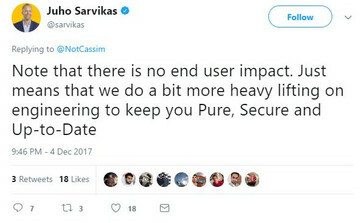 According to Juho Sarvikas, the lack of Treble doesn't affect end-users negatively, as the company will continue to provide excellent software support, which, at the end of the day, is what Treble is aimed at.